UNBEATEN prospects and domestic rivals rarely square off during their rimg apprenticeship, but on Friday night Alfredo Meli (11-0) and Conrad Cummings (7-0) will meet for the Celic middleweight title at the Waterfront Hall in what could be a fight of the year contender dubbed ‘All on the Line’. While defeat for either man certainly won’t mean the end of the line, victory in this Cyclone Promotions bill will catapult the winner towards big fights on big nights in 2016. It is an intriguing clash of styles and backgrounds. Meli, the all-action southpaw who also holds down a full-time job as a mechanic going up against Cummings, a power-puncher who trains full-time under Shane McGuigan in London. Opinions are divided on just who will have their hand raised on the night, but everyone agrees that they are sure to witness something special once the bell sounds. Tickets for this showdown have been snapped up by fans who are excited by a genuine ‘pick em’ fight and naturally both men are confident – yet respectful – going into the title clash. 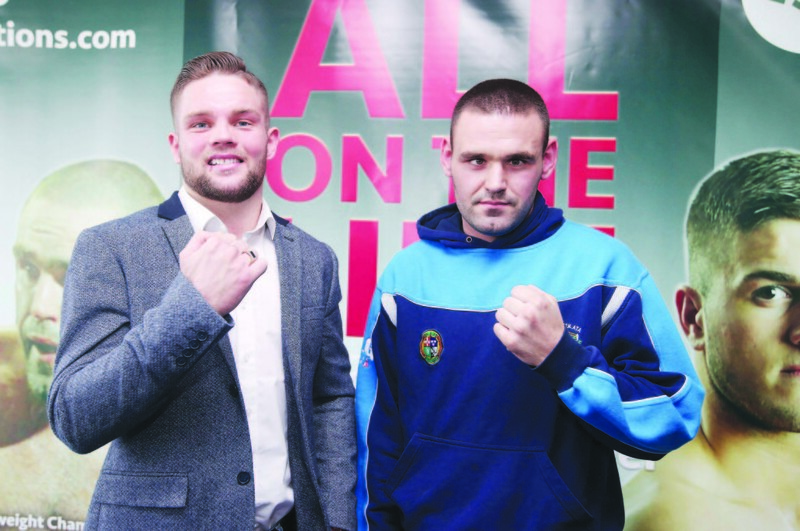 “People want to see these type of fights, but they very rarely happen,” said Coalisland native, Cummings who boxed as an amateur out of Holy Trinity. “Meli is coming in at 11-0 and I’m 7-0 so it’s a risky fight for both of us at this stage of our career’s, but these are the fights you want to be in. “I’m not looking past Meli, but it’s another step on the ladder to where I want to be, so I won’t be letting him stand in my way. While Cummings’ pro career has received more attention than his West Belfast opponent due to the fact he has appeared on the big shows in Belfast and the USA headlined by his stablemate, Carl Frampton, Meli comes in somewhat under the radar. However, he has proven that he can fight over long periods at a high pace, as evidenced by his eight round points victory over Rhys Pagan at the Feile Marquee in the summer. Meli has always insisted he wanted to bank rounds after his victories and these could be key against ‘Dynamite’ who has not gone beyond six. ‘Fredo’ dismissed any talk that this one will end early and can see nothing but a tough, ten-round battle. “I have never lay down for anybody and I don’t plan to now,” he stressed. “I plan to stay there for the full ten rounds and make it a tough fight. “He has power – I’m not going to take that away – but you don’t know how he has grown. Yes, he’s grown physically, but has he grown mentally? I know I won’t be running away. “I had a high-paced fight against Festim Lama, Dan Blackwell was a high-paced fight and the most recent one against Rhys Pagan was even higher again. These strengths are volume punching and a style that is built for toe-to-toe battle. The Ballymurphy native loves a tear-up, but this could be to his detriment against the big-punching Cummings who he says he wouldn’t trade places with as far as full-time training goes. Meli enjoys his life inside and outside the ring, training at the Immaculata club at night after a day working as a mechanic for Vauxhall. He knows he has the engine to put the brakes on Cummings’ hopes this Friday, but acknowledges it will be a tough battle, but one the Belfast public may talk about for years to come. “He thinks he’s going to put me away, but I know I can go and do the ten rounds so it’s just another fight to me,” says the 25 year-old. “It’s a 50-50 fight and will be a tough night for both of us. Whoever wins on the night will deserve it. “We are both confident. I’m confident going into the ring and he will be too because we both know what we can do. There is previous between these men with Cummings getting the nod in the Ulster Seniors several years back, but this is unlikely to have much, if any impact come Friday. The longer distance and smaller gloves are just two factors that makes their previous meeting obsolete, while Cummings’ experience of being under the spotlight on the big stage a bonus for him. The 24 year-old holds a slight height advantage although the clash of orthodox v southpaw could make it a little difficult for him to detonate his bombs. He anticipates the styles will mesh well and is naturally confident of victory, and like Meli is expecting a classic. “Meli is known for volume punching and I’m known for pressure and hitting hard, so we should gel, but we will see how long his battery lasts,” he chuckled when his opponent was likened to the ‘Duracell Bunny’. “I’m training for 10 hard rounds, but it should be an exciting fight however long it may last. Both men are confident and are right to be. It is an intriguing clash will so many questions set to be answered on either side. Fights like this don’t happen as often as they should so credit to both camps for stepping up. Those heading to the Waterfront on Friday are in for a treat.